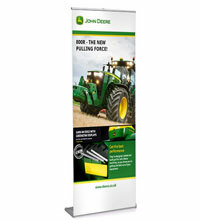 Here at RAL Display, we’re probably a little bit more obsessed with display stands and banners than most. Having been in business for over three decades, high-end display stands and related products aren’t just our business, they’re a genuine passion for us. We see it as our job to ensure that you and your business invest in only the finest products on the market which will not only serve you proudly and give others a winning impression of your brand, but go on doing so for the long-term. We’ve created and supplied Free Standing Display Stands for thousands of businesses to be used in an infinite number of working and promotional environments. These innovative stands feature units from our cable, rod & modular stand collections and can be customised in a variety of ways. Manufactured using the highest-quality materials including a stylish anodized aluminium frame, our Free Standing Display Stands are not only built to last, but are extremely lightweight and durable to boot. Easy to transport, solid and sturdy thanks to heavy steel feet and with an undeniably elegant contemporary look, they’re brilliantly suited to expos, conferences, marketing events, in-office use and for standard commercial marketing in and around retail stores. We’re proud to offer the most outstanding range of contemporary Sign Holders & Poster Stands on the market – again crafted with performance, quality and the reputation of your business in mind. 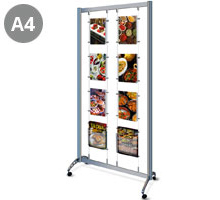 Each unit features the same simple ‘snap’ poster frame mechanism for convenience and versatility, along with easy assembly and flat-packing for transportation to and from marketing events and expos. We like to see our Sign Holders & Poster Stands as a demonstration of the true power of smart simplicity. These discreet and stripped-back marketing tools are often referred to as the ‘silent salesman’ for your company – an asset that makes an impact on your target audience without having to scream and shout. An absolute must for menu displays in restaurants, our Sign Holders & Poster Stands have also become firm fixtures in hotels, galleries, sporting venues, conference halls, car showrooms, schools, hospitals and dozens of other premises and properties alike. Available in three sizes and made with the highest-grade aluminium, our Sign Holders & Poster Stands are uniquely cost-effect and simple to use. Designed to make maximum use of even the smallest amount of available space, it’s their understated elegance that makes them an ideal addition to pretty much any business in any industry. Since going into business, our Pop up Display Stands have become something of a signature product for us – a range we’re known to be outright market leaders in. When it comes to convenience, ease-of-use, versatility and show-stopping performance, our Popup Display Stands tick all the right boxes and then some. Our Graphic Display Stands for example represent the ultimate all-in-one solution for standing trade shows and expos without breaking the bank. High quality imagery is presented with elegance and professionalism using a gracefully curved display stand with lighting and a transportation case which is seamlessly converted into an attractive podium. Incredibly, these superb-looking stands fold down and are stored in the two compartments of the case for effortless portability to and from marketing events. For that little something extra, we also stock an outstanding range of Popup Display Stands with support for flat-screen televisions or monitors. These stands share all the same properties as our standard Popup Display Stands, though with the addition of a powerful multimedia element to boost impact exponentially. 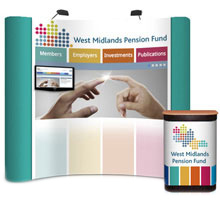 Our range also includes a number of Velcro-friendly Popup Display Stands, L-Shaped Stands and a selection of Bundle Offers for the best possible value-for-money deals. 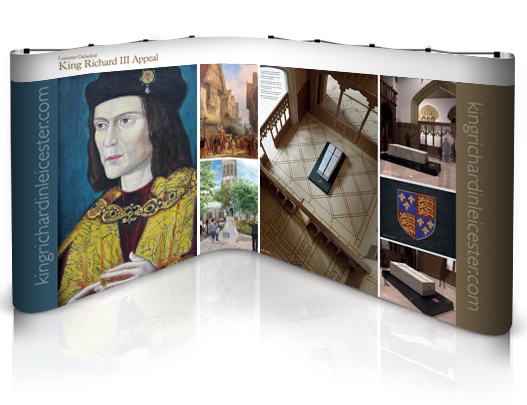 Our market-leading range of Panel & Pole Display Stands was created with total versatility in mind for the ever-changing environments of schools, colleges, universities and business premises alike. Available in three sizes - 900 x 600mm (approx. 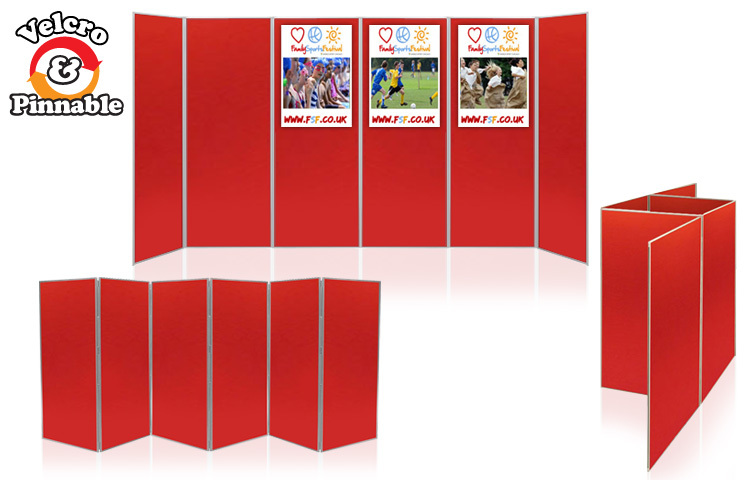 A1), 1000 x 700mm and 1000 x 1000mm – these display boards can be easily interlinked and separated as and when required. We also stock a variety of colours to ensure that perfect fit with any existing décor. Built with versatility and ease-of-use in mind, all of our Modular Display Stands are double-sided and feature high-quality pin and Velcro-friendly coverings. 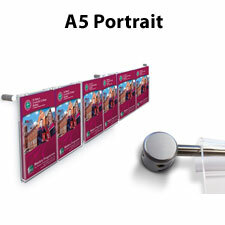 This allows for the easiest attaching and removal of posters, informative literature and marketing materials of any kind. Each board also features sturdy circular steel base feet for maximum stability, along with aluminium poles to keep weight to an absolute minimum while maximising strength. Along with classroom and business settings, these Modular Display Stands make the perfect choices for expos and marketing events of all kinds. A wide range of accessories is also available featuring everything from additional lighting to carry bags to castors and more – ideal for use on-the-go. And with a five-year guarantee as standard covering all panels, poles & bases, it’s an investment in quality you can count on for years to come. RAL Display is able to offer a superior package of quality and value for one simple reason – everything we do is custom-built just for you. We’re committed to offering total customer commitment and providing a one-stop solution to all display stands and banner marketing needs covering businesses, educational environments and commercial settings alike. With over 35 years in business, we’re uniquely able to meet the needs of our customers right down to the finest detail – all with the promise of the lowest prices on the market. For more information or to discuss an order, give the RAL Display team a call today on 0116 2554640.